Frankincense was considered precious enough to be presented by the Wise Men to the baby Jesus, along with gold and myrrh. It is a natural substance which was greatly valued in the ancient world. What was it that made frankincense a precious gift fit for a king? FrankincenseFrankincense was valued historically, and used as incense in religious ceremonies, while certain frankincense species were used for medicinal purposes. A natural resin product made from tree sap, frankincense is harvested in a number of countries in Asia and the Horn of Africa, principally Somalia, Ethiopia and Oman. The quality and properties of the resin varies between the species of Boswellia trees and the location it’s harvested from. The Compton Group are interested in developing new uses for extracts from frankincense, and are interested in a particular species of frankincense (Boswellia frereana) often called the “king of frankincense”, or Asli in Arabic, that is found growing naturally only in Somalia. It has a different bouquet of chemicals to that of other Boswellia species. Modern bio-purifying techniques available at a specialist unit at Bangor University have enabled scientists and commercial developers to work together to isolate, identify and measure the purity of some of the active ingredients within the natural product. Identifying and isolating the active compound from the whole extract of frankincense is an essential link in the chain to enable companies to develop pharmaceuticals or nutraceuticals from natural products, in the knowledge that the active ingredients are pure and will behave in a consistent manner which is essential for good manufacturing practice and quality control of the finished product. 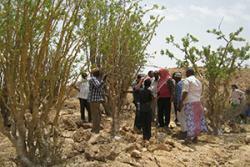 Farmers surveying a frankincense tree in SomaliaThe work completed by Bangor University’s School of Chemistry and BioComposites Centre should enable commercial development of new uses and applications for new products derived from frankincense. Dr Ahmed Ali is research consultant to the Compton Group, who are in discussions with commercial collaborators in the USA investigating commercial developments and efficacy testing of new products based on frankincense. 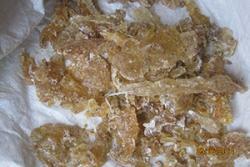 These will enable people to use and appreciate the benefits of frankincense. “I’ve been investigating frankincense for over ten years and am delighted that developments are moving apace. The Compton Group were able to work with Bangor University’s School of Chemistry through the BEACON project, an initiative led by Aberystwyth University together with consortium partners at Bangor and Swansea Universities. The project enables companies to access scientific and technical expertise and a range of pilot-scale equipment to develop new products and processes. Compton Group’s development work on frankincense was supported by the Beacon team at Bangor University through the use of advanced chromatographic techniques which are at a much bigger scale than that generally available.